When last week’s heat wave broke, I felt the need to get outside and move. What I needed was more than my usual early morning outing, which is an everyday necessity. So after Mom and I returned from Mass, I quickly changed, put some supplies into a small pack, and hit the road. Patrick wasn’t able to join me, so I headed north by myself (technically, it was northwest but let’s not quibble). After an easy 90-minute drive, I arrived at Monadnock State Park. If anyone has wondered why New Hampshire is called the Granite State, a hike up the White Dot trail will provide all the evidence needed. The trail is mostly a mix of rock- and boulder-scattered sections and sheer rock faces, all of which can be climbed without gear although not without a fair bit of scrambling. But that’s a big part of the fun. The trail gets above treeline about two thirds (or maybe three quarters) of the way to the summit. The views, especially on a clear day, are spectacular. Along the trail edge and occasionally in the cracks between ledges, I discovered low bush blueberries. It’s still early in the season, which doesn’t really peak until mid-August, but it wasn’t hard to find some purple berries. Several were tart, but plenty were sweet. I pointed them out to a family resting nearby, explaining to the two pre-teens how to spot the leaves and berries. Having done a fair bit of hiking with my three when they were younger, I’ve learned it’s always helpful to have a goal — other than the summit — to keep them moving along the trail. The bare summit — 3,166 feet/965 meters elevation according to the rock carving — provided 360° views of the surrounding area: the White Mountains and Presidential range to the north east and, just barely visible (like a mirage that disappears and reappears), the Boston skyline to the southeast. In the video, you can hear the crows – or maybe ravens? – cawing as they rode the air around the summit. I lay back on the warm stone, savoring the view, sounds, and breezes for a while. Then I enjoyed a snack and a few rounds on Sock #2 before heading back down. You didn’t really think I’d leave home without my knitting, did you?! 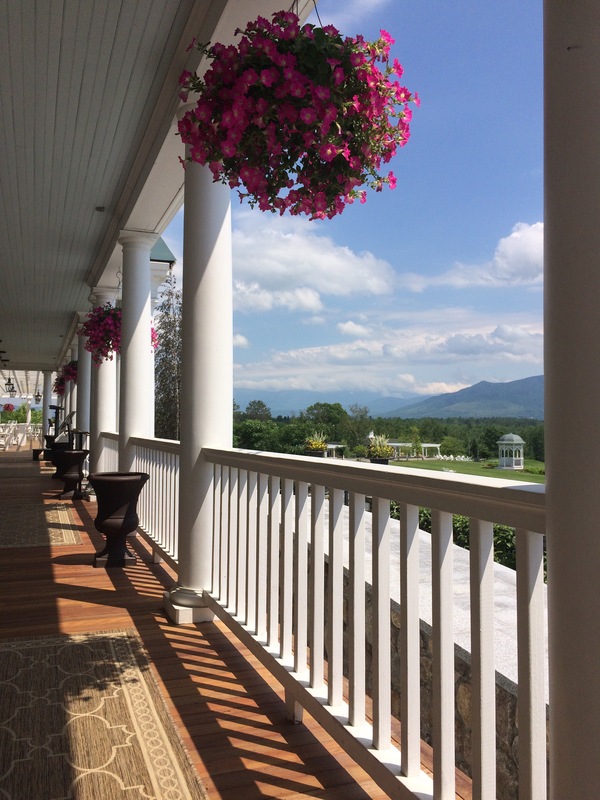 As the rain passed and the sky began to clear over the White Mountains, we spent a lovely hour or so of our anniversary weekend on the hotel’s big front porch. About a dozen or so people sat in the white Adirondack chairs, in small groups or solo, chatting, reading, “phoning,” or just sitting. As luck would have it, a fellow knitter appeared, swapping out her newspaper for circular needles on which was a cowl-in-progress, knit in a gorgeous variegated yarn of blues and speckles of green, black, yellow, and purple. Of course, I had to strike up a conversation. It’s what knitters do. And like most knitters, Annie was more than happy to talk about her project, where she got the yarn (vacation to the Cotswalds in England last year), the other project she’s working on (a drapey cardigan by Brooklyn Tweed, the name of which escapes me and I’d get lost looking through their wonderful patterns), and her next project (Purl Soho’s Ombré Wrap). 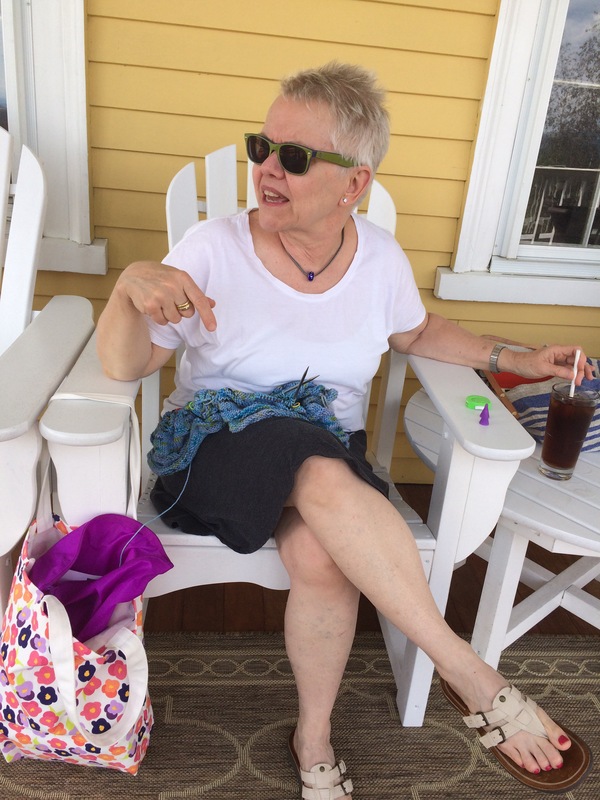 I’m curious — when you see someone knitting, do you strike up a conversation? In celebration of our 25th anniversary, Patrick and I are spending a few days in the White Mountains of New Hampshire. Our plans for hiking every day have been dampened a bit by a combination of rain, thunder, and lightning — not a good combination if you’re above the tree line! Before a low elevation hike yesterday, we wandered into the hotel’s barn where we discovered dozens of fiber producers: sheep, goats, alpacas, llamas, and a litter of six-week old rabbits. Before being spun into yarn skeins, the fiber is stored in bins, each labeled with the name of its “source.” Love the names: Frisbee, Mariposa, Chaplin, Millie, and Ginger. There’s a display of different fiber types, just around the corner from the alpacas and llamas. As part of its programming, the hotel has needle felting workshops and demonstrations on turning sheared fiber into yarn (washing, carding, spinning — and everything in between). They also sell rovings, yarn in a variety of weights, felting kits, and felted insoles to keep your feet warm and cozy. Much to my delight, the hotel sells yarn from its own animals. I haven’t made my choice yet, so more about that in a future post.